A student's teachers and registered parents are automatically added to the learning team and cannot be removed. This article provides steps on how to remove the members of a Learning Management Team. Administrators who need to remove a staff member from the student learning team can do so by auto logging into the staff members account and click on 'Leave Team'. Other staff members who who have joined a student's learning team can leave by going to that student's record in School Loop, and clicking the Leave Team button as pictured above. 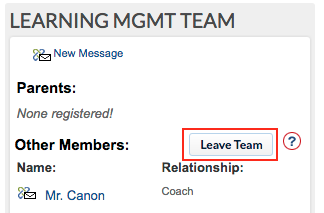 Clicking the 'Leave Team' button removes the staff member from the Learning Management Team system and their records do not display in the portal thereafter.